1,001 ACT questions with step-by-step solutions Ready to take the ACT? No sweat! 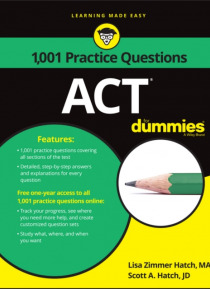 With 1,001 ACT Practice Questions For Dummies you get 1,001 opportunities to prepare for the test. Complete with detailed, step-by-step solutions, each practice ACT question gets you one step closer to a great score on the most popular college admissions test and getting into the school of your dreams. Practice your w… ay to ACT test-taking perfection with the help of For Dummies! Includes one-year access to practice questions online Offers 1,001 practice questions from easy to hard Tracks your progress, so you can see where you need more help and create your own question sets Provides detailed, step-by-step answers and explanations for every question If you're a student with college in your sights, 1,001 ACT Practice Questions For Dummies sets you up for success!